I was delighted to be invited to take part in this blog tour especially as the author generously offered to write an exclusive post. Read what Claire Dyer has to say about polyamorous relationships! Like many authors, I’ve caught the love triangle bug. It all started when I took part in one of those ‘sum up your book in three words’ things on Twitter. I’d just begun the novel that was to become The Last Day and replied, ‘Crazy Love Triangle’ but I didn’t really know at that stage how this particular love triangle would play out. I’d also been aware of features in the press about polyamorous relationships which seem, on the face of it, supremely glamorous but, being a monogamous type, I do struggle to understand how these might actually work out. But, in the spirit of tapping into the zeitgeist, I wanted to blend the two and so in the novel I have my three main characters living in the same house as one another and all loving each other in slightly different ways, the result of which is that decisions get made and choices are taken that change their lives forever. And, what I also decided to do in The Last Day was to alter the standard dynamics of the love triangle and make my two heroines like each other. As Vita says about her husband’s new lover, ‘… it would have been easier if I’d hated her’ but she doesn’t. What I wanted to do in this book was to talk above love in its many colours and so in my love triangle, there are no clear lines. In fact, it’s less of a triangle and more of a Venn diagram with a number of interlocking sections. However, let’s just think about some other love triangles. There’s Scarlett, Ashley and Rhett in Gone With the Wind; Ilsa, Rick and Victor in Casablanca; Bella, Edward and Jacob in The Twilight Saga; Bridget, Mark and Daniel in Bridget Jones’s Diary and the huge array of triangles in Jane Austen’s novels, including: Elizabeth, Darcy & Wickham; Marianne, Brandon and Willoughby; Elinor, Edward and Lucy, and let’s not even get started on Shakespeare! The list, it seems, is quite endless. What is it that makes love triangles so beguiling? Personally, I love writing them because they’re a challenge: can I write from three different points of view and make each one so that the reader believes in them and wants what they want, so that if there is a ‘happy ever after’, even if someone has to lose out in the end, the reader is on the side of all three? The plot possibilities of love triangles are infinite and that’s what makes writing them such a wonderful thing to do. 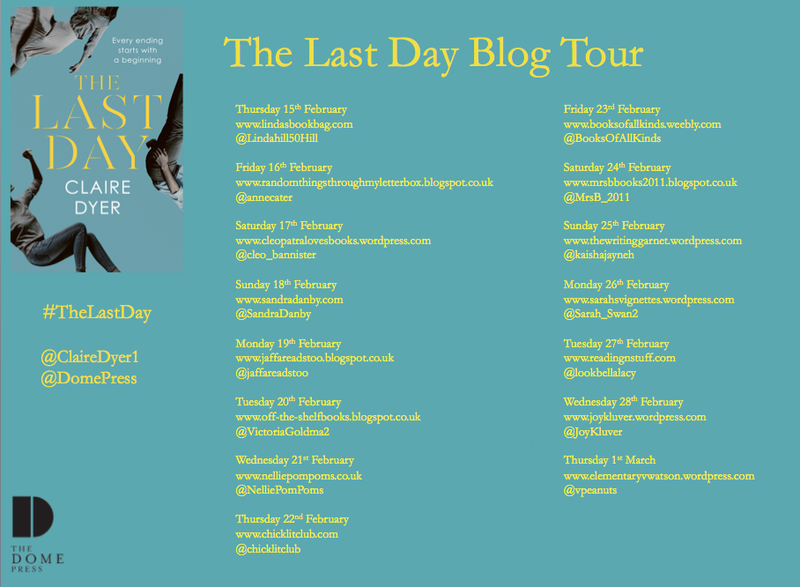 The Last Day is a poignant and beautifully written novel and although it is quite different to my normal choice of reading matter, I loved it. The synopsis had me wondering what I’d let myself in for. We have Boyd in his forties moving in with his wife along with his twenty-seven year old new girlfriend. 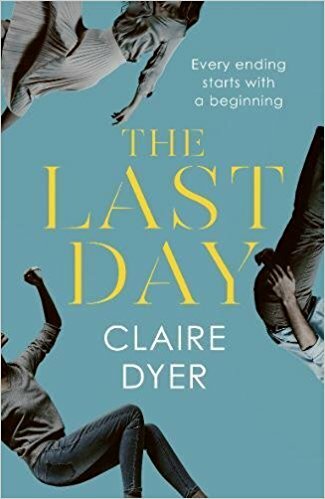 The cynic in me doubted whether this was really a likely scenario but what Claire Dyer excels at is characterisation, and boy did these characters get under my skin. Boyd and Vita have been separated for six years and the reader has to wait quite a while to find out what their last day consisted of before the decision was made to go their separate ways. Honey the young girlfriend works with Boyd at his Estate agency along with the steadfast Trixie. Honey is far more likeable than I’d imagined she would be but like all of the protagonists in the book has secrets. As the book progresses I wondered which one of these was going to blow the roof off the set-up. Boyd, Vita and Honey are people with faults and pasts, but they are also incredibly real and ultimately ‘nice’ people. If you are looking for a tale of discord, this isn’t the book for you. The story is told from different viewpoints with each chapter devoted to one or other of the characters. This is done so very well as we slowly get to know all the different aspects to each one. I’ll admit I was drawn in by the excellent writing; this was one of those books that I started and knew that I would enjoy whichever direction the book followed. This isn’t a typical tale of dysfunction, it is actually a sympathetic portrayal of marriage, love the way life changes and grief. Now I usually steer well clear of books concerning grief because this is a topic I don’t like to dwell on but perhaps because the grief in this novel is not raw and the characters concerned have an understanding of the journey they’ve been through, I found it in accordance with my own experiences in some of the smaller details. I certainly think it helped that the author somehow manages to acknowledge that everyone grieves differently. This is a reflective book which if I were reading those words in another person’s review I’d take to mean slow, but this book isn’t. Instead it is one of those rare novels book that allows you to think about what you’ve read, sometimes by reading between the words, a difficult skill to pull off but so very effective when it is done as well as it is in The Last Day. I doubt whether there will be many readers that don’t happen upon a situation or characteristic that they recognise either in themselves or someone close to them. As I said earlier the characters make this book, there is a certain amount of looking back which I think is common once we get to a certain age, but plenty to keep the reader entertained with the emotions that lie behind the characters actions. There is a mystery, a secret – or two or three – and a bit of danger to spice things up so there is no time to get bored. I was very sad to say goodbye to all the characters but particularly Vita and her pet portraits as she entertained me with her no-nonsense attitude, one that hides a multitude of complexities. I’d like to say a big thank you to The Dome Press who provided me with an advance copy of The Last Day. This unbiased review is my thank you to them. Even better I realised that I have one of this author’s previous books The Perfect Affair on my kindle and it now won’t be long before I read that one too. It sounds as intriguing for the writer to have made the decision to immerse herself in imagining a love triangle with a twist as it would be to read about it. It reminded me of recently reading Stay With Me by Ayobami Adebayo which is an excellent account of the arrival of (in this case and society) a second wife, after much pressure on the husband by his family. I’m surprised there aren’t more novels written that explore this dynamic given that it continues to exist in many cultures and those cultures are coming closer to connecting with our own, maybe it’s a sign of things to come. I also remember watching some of the TV series Big Love, which explores a Mormon father in a suburban setting with three wives (though publicly only one), who appear to be the best of friends. It’s compulsive viewing, for one because it doesn’t feel sustainable that they could all be so amicable and play along as if they were regular households. As you say in your own reading above, you are just waiting to see who is going to blow the lid off things. They are certainly intriguing psychological concepts to explore in literature and film, while harder to imagine in reality. Though I do have a very good friend (and I was a bridesmaid at her wedding in NIgeria) whose husband is the eldest son from a polygamous family (his father had six wives) and the result of his upbringing and experience is that he is sticking with one wife, one daughter and long and happily have they been married! It’s an interesting concept but quite hard to get your head around how it ever works in practice- it wouldn’t be for me! How interesting that your friend’s husband also decided against perhaps it doesn’t seem so appealing close up? Thanks, Cleo, for the thorough and well-written review. This is certainly a very interesting dynamic on a lot of levels. And I can see how it might be a fascinating context for a novel. Oh, one thing I noticed – a character named Trixie and a character named Honey? Wonder if the author read the Trixie Belden mysteries when she was young – Trixie’s best friend was named Honey. Ha! I loved those and, of course, I had to bring my comment around to ‘mysteries’. I’d be interested in reading about how this dynamic came about – and how it is resolved. It is one that I cannot imagine ever being successful. As one commenter mentioned above, the show Big Love explores the dynamic of multiple wives, and I enjoyed it. I’ve also rooted for one character over another in the usual fictional triangles in books and movies. This book sounds like we might root for all the characters. Thanks for sharing. I’m not one for love stories but I’d read this. It sounds every different from a traditional romance. It’s a compelling premise and not one I’ve seen in a book until now. Great review! I tend to roll my eyes at love triangles, but this sounds like a nicely executed messy knot! I can’t imagine the challenge an author takes on when juggling so many perspectives! This is one story I think I would enjoy… From a distance! Oh this does sound like a good book! In a similar vein, This Year, For Sure by Zoey Leigh Peterson (Canadian author) is also about a polyamorous relationship, so if you want to read more about this topic, make sure to check that one out! It sounds like it would be a bit more literary than the one you review here. I’ve made a note of that one Anne – thank you so much! Thank you for the review. New author and new book for me. I will be looking out for books by this author now.